The presenting sponsor for SOQS is the Roundhouse Foundation and other major event sponsors include The Stitchin’ Post, Morrow’s Sewing and Vacuum Center and Baby Lock, The Old Mill District, Black Butte Ranch and High Desert Frameworks. The Sisters Outdoor Quilt Show, the largest of its kind in the world, takes place on Saturday, July 13, 9am-4pm throughout Sisters. Over 1,300 quilts will adorn every building, fence and railing available with styles ranging from hand-quilted heirlooms to contemporary art quilts. The show is honored to feature the artwork of Sisters artist Dan Rickards on the 2013 show poster, Streams of Color. 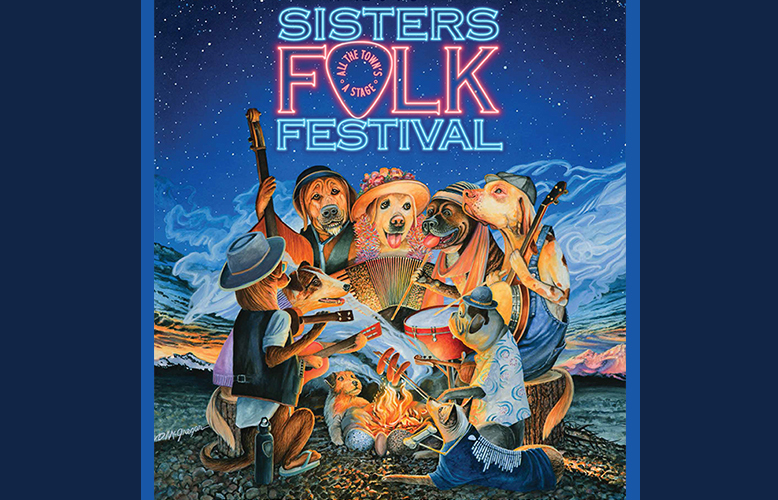 An annual collector’s item, this year’s poster captures the essence of Sisters in Dan’s realistic and detailed style. 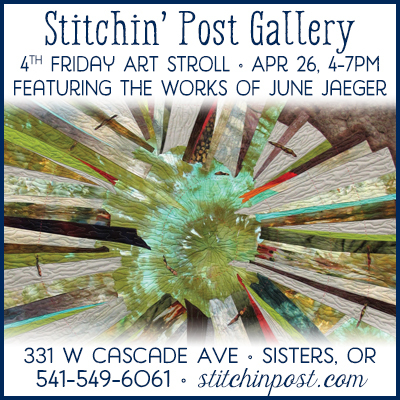 Posters, t-shirts and other items featuring Dan’s artwork is available at the Stitchin’ Post in Sisters. The quilting extravaganza week kicks off with the 10th anniversary of the Around the Block Fiber Arts Stroll and Quilt Walk on Sunday, July 7. 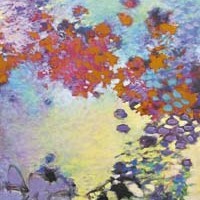 The art stroll, presented by Clearwater Gallery of Sisters, offers over 25 locations where visitors can watch the fiber artists demonstrate their craft and purchase their work. This year’s fiber art includes pine needle basketry, sculptured fiber bowls, fly tying, hand-painted fabric, spinning, weaving and adorable felted creatures. 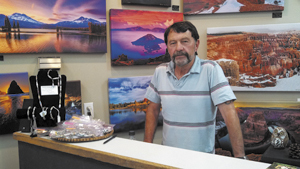 The annual Quilt Walk showcases over 100 quilts inside SOQS sponsoring businesses during July. 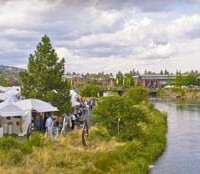 The Old Mill District in Bend also participates in the Quilt Walk from July 5–21 with over 20 locations. 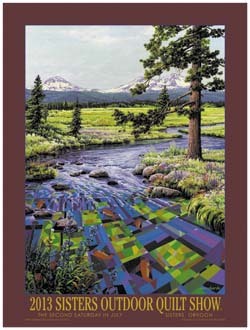 The annual featured quilter exhibits include the very best of the art of quilting and highlight the quality of work done throughout Central Oregon. Kristin Shields of Bend is this year’s Featured Quilter. Her liberated piecing and original applique work is creative, funky and very fun. Ruth Ingham of Black Butte Ranch is the Inspirational Instructor and the work of Tammy MacArthur from Redmond is featured in the Machine Quilter Showcase. The annual fundraising event for 2013 is a screening of the film, Stitched, featuring three quilting super stars as they prepare their entries for the Houston International Quilt Festival. The producers will be in Sisters to host the film on Tuesday, July 9 at Sisters High School and the evening will feature a dessert tasting, great door prizes and some fun surprises. 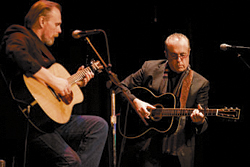 Two leaders of the Modern Movement in Quilting are the featured speakers during Save it for Sunday at FivePine Lodges. Alissa Haight Carlton and Elizabeth Hartman will lecture on Modern Quilt Design and a large selection of quilts in that style will be exhibited throughout the grounds of the FivePine Campus on Sunday, July 14. 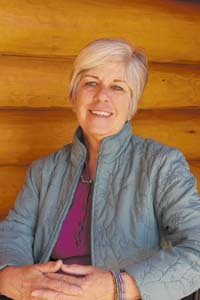 The Board of Directors of the Sisters Outdoor Quilt Show has named Jeanette Pilak as the in-coming executive director for the event. Pilak will replace current Executive Director Ann Richardson, who announced her intention last fall to step down from the position following the 2013 Show. Pilak has joined the staff to participate in this year’s show and will assume her new role on about August 1. Pilak is a recognized cultural non-profit organization professional who has worked extensively in Oregon as well as other states. Her experience with arts and cultural organizations of all sizes, proven leadership in working with businesses, staff and volunteers, as well as her connections with state and national non-profit resources, were all influential issues in her hiring, according to Jean Wells Keenan, coard chair. In addition, her background includes successful fundraising and development campaigns as well as management of events of all sizes.